As a property investor, what are you actually investing in? Things sure have changed over the last 100 years or so. I was looking over the shoulder of a student doing a deal in regional NSW the other day. The house was old – built sometime around 1916, though the council records didn’t go back that far. It was just a guess. The house itself had a tonne of charm, but it was tiny. Like crazy tiny. It’s hard to imagine how people used to pack large families in there. But the really crazy thing was the block was huge – almost 1,000sqm. The house was squished into the front of the block, and out the back there was effectively a small paddock. I found it funny to try and put myself back in the day and understand what they were thinking. But I think it probably came down to economics. Back then, land was cheap, and building was expensive. It’s easy to forget how much technology is embodied in our houses these days. They still look more or less the same, so it doesn’t quite feel like comparing an ipod with a gramophone. But there’s a lot to tech these days – from aluminium or even soft-pine structures, to excavators digging up trenches for the sewage – building a house is a totally different game these days. 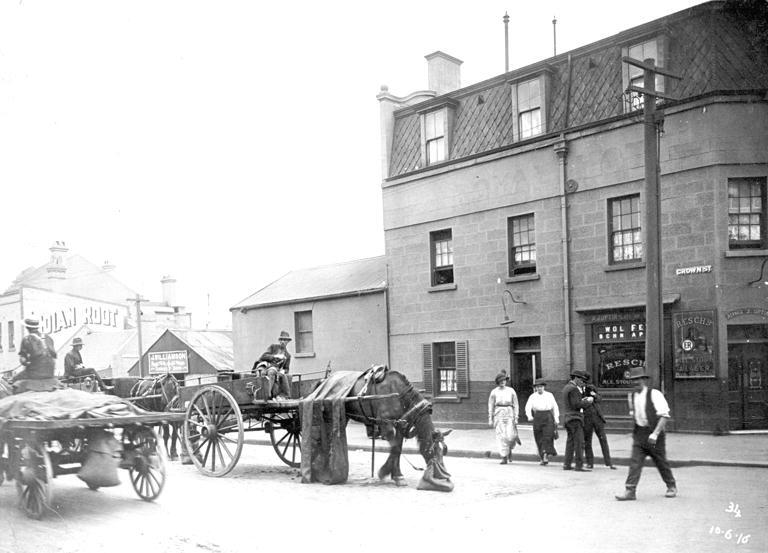 And there’s no data going back to 1916, back when all your hard wood timbers were delivered by horse and cut by hand. But I’m guessing that the land – especially in regional NSW at the time – was a fraction of your total costs. It was probably almost entirely in the build costs. What? I don’t know: 80:20, 90:10? Maybe the land only accounted for 10% of the cost of a new home..? So in that context, if you wanted a cheap worker’s cottage, you didn’t skimp on block size, you skimped on house size. The result: small houses on large blocks. Things have changed a lot, and I actually think in my life time we could see this ratio reverse. Building costs come down year after year. You can already have a machine 3D print a house for you. Labour costs are falling, material costs are falling… houses are getting cheaper to build. The result? Larger houses on smaller blocks. Now, this isn’t just some quaint history lesson. This is one of the fundamental things you need to understand about the property market. When you buy a property, you’re effectively buying two assets, bundled into one. First, you’re buying a house – the dwelling. This is a physical structure, and it depreciates over time. It gets old and worn out. IT LOOSES VALUE OVER TIME! The other asset you’re buying is the land. This is in fixed supply. They’re not making any more of it. IT GROWS IN VALUE OVER TIME! You can see this effect in the ABS data on housing values. This chart looks at housing values relative to GDP. As you can see, the “Structure Component” – the value of the buildings – that’s pretty static. It doesn’t change all that much. It’s hovering around 1.0% of GDP. But look at the land component – the blue area. That’s where the real appreciation has happened. It’s launched from about 1% of GDP in 1989, to about 2.8% in 2017. That is, it’s effectively tripled. 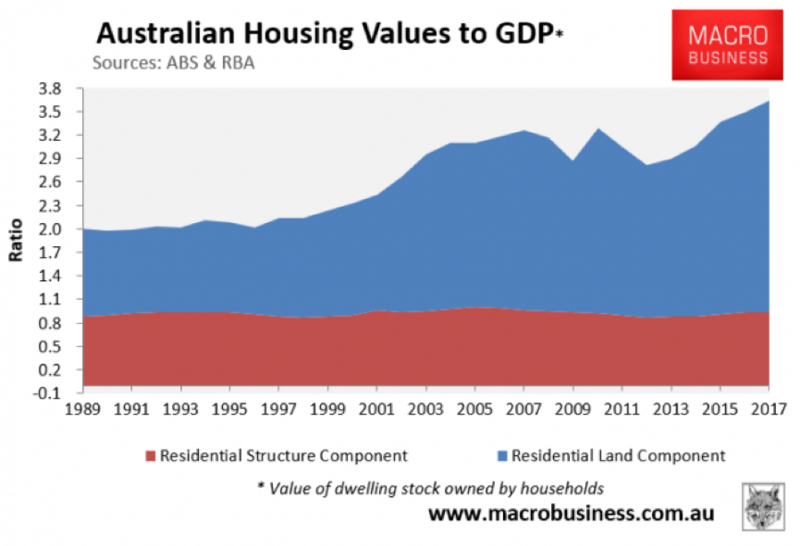 So over the last 30 years, the value of all the buildings in Australia hasn’t changed all that much, while the value of all the residential land has tripled! But even then this hides the real depreciation in the value of our built structures. Think about how massive contemporary homes are now compared to 1989. How many extra bathrooms, media rooms, ensuits etc. Give the inflation we’ve seen in dwelling standards, we really should have seen an explosion in the value of the built component. But we haven’t, because structures depreciate in value. We’re swimming against the tide. So keep this rule in mind: Property is two assets. Appreciating land and depreciating buildings. Without this, you’re lost at sea.